Top 14 champions Toulouse outgunned rivals Perpignan on the weekend to head to the top of the table with a 30-20 victory that was more convincing than the score line indicates. While Perpignan waits in anticipation of the grand arrival on the playing field of Kiwi Dan Carter, it was fellow All Black Byron Kelleher who once again showed that he’s in the form of his life. Kelleher again crossed for a try, but more importantly he ignited a Toulouse side that ultimately had too much strength and depth, despite a valiant fight back from the visitors. Keeping with the trend of us discussing foreign players in the Top 14, we’ve got this nice tackle for you from South African Shaun Sowerby on prop Sebastien Chobet. Chobet was on the receiving end of the solid hit from the bulky Toulouse Eighthman Sowerby, who has developed into a top class player since leaving the Sharks in South Africa a few seasons back. Although he was a star in Durban, Sowerby was never quite good enough to make the step up consistently for the Springboks, but has since proved his worth over in France. Sowerby had some help from his flank, so it was a bit of a gang tackle, but looked good nevertheless. The reaction from the French commentators, as always, makes it even more enjoyable to watch. Note: While our knowledge of big, bald props isn't perhaps as good as it should be, we originally thought this was Perry Freshwater who got tackled, not Chobet, so we apologise if there was any confusion caused. The Cardiff Blues brushed aside Connacht by a record margin on Friday in the Magners League game that broke a record or two. The home side’s seven try blitz in the first half blew the visitors away on a humiliating night for them at the Arms Park. Another two tries in the second meant that the final score was a complete whitewash, at 58-0. It was Connacht’s biggest ever defeat in the Celtic League, but Cardiff’s largest win, eclipsing the 48 point margin that they beat Edinburgh by last year. Incidentally, the record victory for any team is 62-0, which was ironically achieved by Connacht. The try from the game we’ve chosen to feature came from some superb inter passing, in a move that was started by big Jamie Roberts as he bust up the midfield. The passing after that was fantastic to watch, and despite it breaking down after a loose pass by young Leigh Halfpenny to Gareth Thomas, they remained composed and set it up again, which resulted in Ceri Sweeney going over for a great team try. Sweeney totalled 21 points on the night through his goal kicking and two tries. This was Cardiff’s last Magners League game for more than two months, as next weekend they take on Sale in the EDF Cup opener, followed by two rounds of the much anticipated Heineken Cup. Sidenote: We're not physically able to watch every game that takes place, so if you spot something you think would be good on the site, please don't be shy to send us an email or post it in the request section. 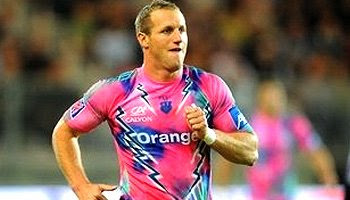 Former Australian Rugby League star Mark Gasnier did not disappoint on his Top 14 and Rugby Union debut for unbeaten Stade Francais on Friday night. Gasnier finished off a fantastic try that contributed to their 32-25 win over hosts Bourgoin. Twenty seven year old Gasnier will reportedly earn close to $1 million (US) a season in his Union adventure under new Australian coach Ewen McKenzie. Former Waratahs coach McKenzie being a strong reason for Gasnier joining the Parisian club. "I admit the presence of Ewen at the head of the team was one of the determining factors in my decision to come and play in Paris. It's important for me to have an Australian coach"
He marked his debut with a handful of strong runs and did what he could playing at wing in his first big Union match at this level. His try concluded a wonderful move that saw Argentinian wizard Juan Martin Hernandez and Italian IRB Player of the Year nominee Sergio Parisse combine with a classy bit of passing before the ball was flung out to Lionel Beauxis. Fly half Beauxis, who scored 16 points with his boot on the night, then delicately flicked the ball on to Gasnier who was on hand to finish a classic Stade Francais try. Assistant coach Christophe Dominici was more than impressed with Gasnier on his first run out for the powerhouse French club. A lovely try, and a great start to his Rugby Union career for Gasnier. We'll keep an eye on his progress throughout the season. Johan Lomu was meant to play in this past weekend's Help For Heroes match at Twickenham, but he unfortunately picked up an injury in training, so instead of showing a clip of him in action from a week ago, I thought it would be a good time to stick this in depth short documentary up. The video, which features some extremely rare footage of Jonah, has been cut down to two 15 minute segments, the first of which you'll be viewing now. 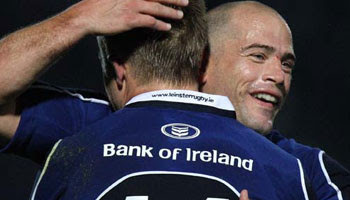 The dvd was handed out at his comeback game in 2005, where he scored a try vs the Martin Johnson Invitational XV. He unfortunately picked up a shoulder injury on that day, but it was a tremendous achievement just be out there to after all his body had been through. The clip goes all the way back to when Jonah was 14, with insight from former coaches and teachers as it goes through his progression from talented forward, to all conquering All Black wing. We get to see never before seen footage of Lomu in his early days on the Sevens circuit, Super 12 action with the Blues and Hurricanes, his meteoric rise at the 1995 World Cup, behind the scenes gym sessions, and a whole lot more. We highly recommended giving this a watch, so if there is one thing you do this weekend, make sure you find 15 minutes to sit down and watch it with a buddy, your old man, or even just on your own as it's thoroughly enjoyable and you'll get to see more of the great man in action than ever before. We've never posted a clip this long before on RD, so for those with slower connections (South Africa comes to mind), apologies, but for the rest of you, we hope you enjoy. Part two will be posted soon. Note: Video editing is as incoming, so one or two bits have bad cuts, but it's no train smash. Twickenham played host to a very special game of rugby this past weekend. It was certainly special in terms of the players on display, but more importantly it was about the rugby public and players coming together to raise money for the Help For Heroes fund. All money raised, announced as being over £1 million on the day, goes directly to the fund which will support the rehabilitation of wounded service personnel who have served their country in Iraq and Afghanistan. As the day began with an emotional video on the big screen of a young soldier who was maimed while on duty, the reality of the cause hit home. Lawrence Dallaglio was quoted prematch as saying , "There is great synergy between the services and rugby, but there is one difference - when rugby players go to work they put their reputations on the line. When those in the services go to work, they put their lives on the line." This was not a political day, far from it. It was a day to pay homage and respect to those who serve their country in the ugliest of battles. So while it was a friendly meeting between two sides made up of legends of the past and young stars of the future, the match was played hard, with both sides giving it their all for the cause. Jason Robinson and Will Greenwood in particular both showed that their time out of the game had no ill effects on their skill level. Robinson himself threatened all match, but it wasn't until the 79th minute that he found some space to electrify the 52 000 strong crowd, and show off some of that magic of old. The Help for Heroes XV (England) featured former stars Lawrence Dallaglio, Martin Johnson, Dan Luger, Richard Hill, Robinson and Greenwood. But it also included young talent, most notably in prop Nathan Catt, who was a standout performer on the day and a real star of the future. The International XV was led by Welsh legend Scott Gibbs, who showed his class, most notably when setting up the try for 18 year old Ospreys flyer Kristian Phillips. Other big names included Kenny Logan of Scotland, Colin Charvis of Wales, and Ireland's Justin Bishop. Both teams, perhaps more importantly, included players from the services themselves, who got to experience that Twickenham atmosphere first hand. An enjoyable match to watch, the Help For Heroes XV won 29-10 in the end. 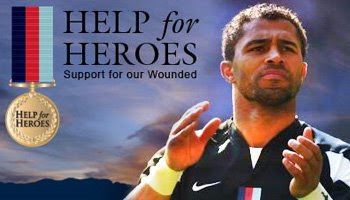 If you would still like to donate to this worthy cause, you can find all the information available to you at http://www.helpforheroes.org.uk/donations.html. Note: There are bound to be servicemen and women who are on duty abroad but sometimes manage to check the site, so if you'd like to leave a comment for them, please feel free to do so. 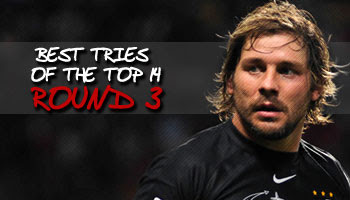 For those of you who enjoy catching up on the latest tries in the French Top 14, we've got another weekly wrap of the best ten, this time from Round 4. Last time some of you guys weren't too impressed with the standard of tries unfortunately. This week the standard is elevated somewhat, as we see some great tries from all across the league. We think these clips are worth showing anyway, because some of you wouldn't be exposed to French rugby otherwise. There's a handful of contenders, but at number one this week is a classic try by Montpellier against Montauban, scored on their way to their 32-10 win. The support play by French international flanker Fulgence Ouedraogo was superb, and he actually managed two tries on the day. Enjoy the clip, and later today we'll have the best bits from the Help For Heroes match that was played at Twickenham over the weekend. Recently we saw Munster up against the USA in a pre-season friendly at Rentschler Field, Connecticut in the USA. Back in June 2005, it was Wales who met the Eagles at the same venue, a match which resulted in a crushing defeat for the hosts. All 11 Welsh tries were converted by Ceri Sweeney, taking the final score to 77-3, as a solitary Mike Hercus penalty was all the hosts could manage against the powerful tourists. We like a bit of variety here on Rugbydump, so this is a short, comical clip from the match that we thought we'd share as it's been lying around for some time now. It shows Hercus, at 63-3 down, throw a bullet pass that certainly looks like it wasn't intended for lock Alec Parker. Parker somehow hangs onto it though, but as he does, the fired up Welsh wing Craig Morgan gets to grips with his jersey and drags him across the turf like a rag doll, perhaps epitomising the day for the home side. A few weeks back in the first round of the Guinness Premiership in England, Bath took on Bristol at the Memorial Ground, a venue at which they hadn't won at since 1998. Despite scores being tied at the break and Bristol matching them in most facets of play, Bath were too strong in the second half, and came out eventual winners 33-20. One of the best moments of the game, and perhaps the season, came shortly before the halftime break from little Samoan bullet, David Lemi. Lemi, who weighs in at 75kg's, is one of the smallest professional players around. That lack of size does nothing to deter him though, as he has had two successful seasons with Bristol, coming out top try scorer in the Guinness Premiership in his second. 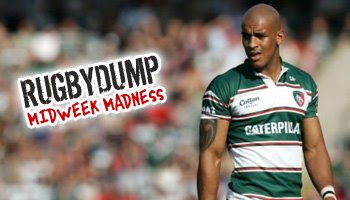 He's also a Sevens star of note, and turned out for his country at the Rugby World Cup in 2007. This try scored against Bath in the 37th minute was sublime, and while there were unfortunately no other angles of it at the time, we felt it had to be shared as he beat no less than six defenders with his balanced running and well timed stepping. He then chipped ahead, getting an unfortunate bounce but still managing to time the dive on the ball under the close attention of big Justin Harrison. In a time when players the size of Matt Banahan are turning out on the wing, Lemi is another one of those small, fast guys who is no doubt an inspiration to the smaller wingers out there. If you're quick, but you've ever doubted you can make it because of your size, just watch Lemi in action. Stade Francais scored an impressive four tries on their way to a 37-16 win over Brive in the Top 14 on Saturday, but the victory came with a price as backrow forward Juan-Manuel Leguizamon was taken to hospital after being knocked unconscious in a high tackle. 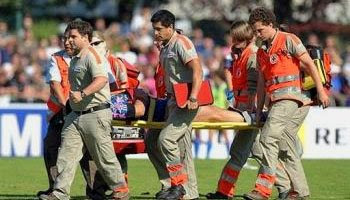 The Argentine player, who was taken off the field on a stretcher, regained consciousness but was having medical tests to check his condition. 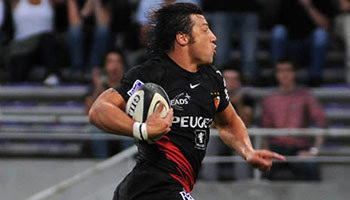 Stade's Australian coach Ewen McKenzie said Leguizamon would be out for up to three weeks. "His absence will be for between one and three weeks," McKenzie said. Leguizamon left the field in the 53rd minute after a vicious high tackle from Brive's Tongan centre Sukanaivalu Hufanga, who was then given a red card. It was a horrible sight as Leguizamon seemingly took the full force of Hufanga’s forearm to the chin, then went to ground in a heap as he was knocked out cold. While it seems as though Hufanga would have been aiming for a solid hit in the chest to bring down the bigger forward, he got this horribly wrong and paid the penalty by not only receiving the red card, but allowing Stade to have their way with the game in the last twenty five minutes while he was off. Initial thoughts? Suspension in order, or was the red card sufficient on the day? Reigning Magners League champions Leinster maintained their unbeaten run as they overcame a spirited Ospreys side 19-13 at the RDS on Friday night. It was the first loss of the campaign for the Ospreys, who put up a good fight despite missing a few key players to injury. They did however salvage a valuable losing bonus point after a late Nikki Walker try that was brilliantly converted from the touchline by James Hook. For Leinster though, it was young flyer Luke Fitzgerald who scored the try of the match at 24 minutes, taking his tally to four for the season after his superb hatrick against Edinburgh last weekend. Brian O'Driscoll sent a flat pass out to Felipe Contepomi who's slick interpassing with Fitzgerald put the birthday boy of last weekend over for a try that oozed class. They say good rugby comes when you do the basics correctly, and Contepomi and Fitzgerald showed exactly that, as the draw pass, draw pass, meant the Ospreys defence had absolutely no chance of doing anything about it. With Nacewa at flyhalf, O'Driscoll and Contepomi in the centers, and the recent arrivals of Wallaby Rocky Elsom and Springbok CJ van der Linde, Leinster now boast a wealth of talent and experience, and will prove a more than formidable opponent this season in the Magners League, and soon, the Heineken Cup. This could well be their season for European honours. UPDATE: It's since been confirmed that Isa Nacewa has actually broken his arm, and was operated on, but will be out for up to two months unfortunately. Harlequins produced a five try thrashing of a poor Bristol side this past weekend in the Guinness Premiership. The match was highlighted by the superb commanding performance of speedy scrum half Danny Care, the Sevens star who is rapidly developing into a player of real quality. It was his replacement though, Andy Gomersall, that made the break that led to this funny incident with five minutes left in the match. Argentine center Gonzalo Tiesi was put into space from the Gomersall switch pass, then stepped the cover defence and ran in for an excellent try from a set piece. Bristol wing Tom Arscott tried in vain to stop him with a tackle over the line as he scored, but to no avail. Tiesi jumped up to celebrate, and with Arscott taking his time getting up, the Harlequins teamates come in to congratulate Tiesi. The more Arscott tried to get away, the more Quins players surrounded him, resulting in Arscott being part of this big group hug. A short clip, but one we found hilarious as the potential for this happening is always there. Harlequins won 31-13 in the end. The French Top 14 is now in full swing after having gotten under way a month back with huge hype surrounding a number of big name players. The controversy associated with players like Sonny Bill Williams proved to be a positive, as clubs such as Toulon were very much in the headlines, attracted huge media presence from all over the world. The action so far has been entertaining, with not only some great tries, but also a few spectacular fights that have caused a stir but made me interesting viewing. We're now heading into Round 5 of the tournament, and this weekend sees a few more big clashes on the cards. League leaders Stade Francais will face off against Brive, while second and third play each other, as Perpignan and Montpellier meet on Saturday night. That's just two of the big games in prospect coming up. This video highlights a few of the better tries from Round 3, giving you a nice broad view of some of the teams and players that compete in one of the more fascinating leagues in world rugby. 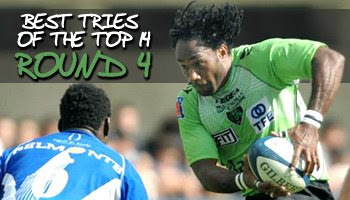 We'll feature more Top 14 tries in the weeks to come, so stay tuned. Gloucester ended their twenty year wait for success at the Recreation Ground this past weekend, as the visitors overcame a Bath side that failed to take the opportunities presented to them. It was an awful day for Bath flyhalf Butch James, who looked anything but himself as he failed to kick five placekicks in a row, and then had a clearing kick charged down which resulted in a try for Gloucester. Gloucester took full advantage, and the resultant victory was sweet after their disappointing loss to Leicester a week prior. Big Bath wing Matt Banahan was one who did please the home crowd though as he had a few strong runs, and then this cracking hit on James Simpson-Daniel that grew groans from the faithful at the Rec. The big hit followed a fantastic covering tackle from fullback Nick Abendanon on big Lesley Vainikolo. A tackle that, for some, could even be more impressive than Banahan smashing the little guy. So while Abendanon showed little regard for his body and brilliantly took Big Les out at the legs, the 6ft7 Banahan used all his power to simply launch into Simpson-Daniel, rocking him back in a mismatch that proved to be a fairly spectacular looking tackle. Simpson-Daniel, being the type of player that he is, got his revenge though later in the game after Banahan looked in on goal, but was denied when the little guy tracked him down and made a great defensive tackle. Good rugby all round, except the goal kicking that is. Young Munster fullback Keith Earls notched up a hat-rick of tries and landed the Man of the Match award against the Newport Gwent Dragons on Sunday, as the European champions romped to a 50-6 Magners League win at Musgrave Park. Earls was in superb form, stealing the show as the Munstermen ran in seven tries against a hapless Dragons team that are low on confidence after losing their first two league games. In only his second competitive start for the senior side, 20 year old Earls followed on from his three tries from two pre-season games, and his one against Edinburgh on league debut. Receiving the ball on the run from center Lifeimi Mafi, the show and go dummied pass to Ian Dowling opened up the space on the left touchline before Earls kicked ahead, chased, and with the bounce not quite perfect, he nonchalantly chipped the ball up into his hands before crossing for a superb individual try that had the crowd on their feet. With Leinster’s flyer Luke Fitzgerald scoring three of his own on the same weekend, Irish rugby looks to have a pair of young stars in the making, both of whom seemingly posses the raw talent and confidence to become big names in the future. The Magners League champions Leinster will meet Heineken Cup holders Munster at the RDS in two weeks time, a head to head that will see some of the finest Irish stars up against each other, as well as a flying Kiwi or two. It’s a match not to be missed and we’ll do what we can to feature it on here. 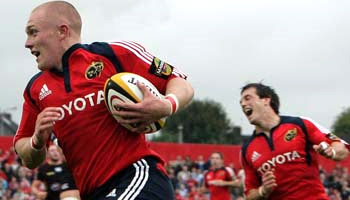 As for Keith Earls, remember the face because you're going to be seeing a lot more of it in the months to come. The Blue Bulls smashed the Boland Kavaliers 69-19 at Loftus Versfeld on Friday evening in a Currie Cup match that was jam packed with action, featuring tries a plenty, but not without the odd huge hit to rub salt into the wounds. The half time score sat at 38-0, and by the 55th minute the home team had notched up 11 tries, prompting them to take their foot off the gas slightly, allowing the Kavaliers to run in three consolation tries of their own. The physical nature of the Bulls, combined with the passionate (sometimes hostile) crowd, make Loftus Versfeld a very difficult place for any team to visit. That intimidation factor, combined with a pack of gorilla's waiting to rip your head off, means that smaller unions like Boland are normally on a hiding to nothing when playing away in Pretoria. This hit by burly Springbok and Bulls prop Gurthro Steenkamp is no doubt a contender for hit of the season, as he absolutely laid into Kavalier replacement Cecil Kemp. I don't need to say much more about it. Just watch the vid. Last weekend in the Top 14 we saw Toulouse brush Biarritz aside at the Ernest Wallon stadium as they won the round three match easily, 20-6. The Top 14 champions of last season were ruthless after Kiwi Byron Kelleher opened the scoring with this fantastic try at the nine minute mark. Cedric Heymans scored a late try to secure a bonus point for the home side, but it was Kelleher's effort that was most impressive. For a guy who is, to some, reaching the end of his career, he showed tremendous acceleration to pull away, and then put the foot flat as he coasted in under the posts. I'm not sure what happened at the back of the scrum there, but the referee seemed to rule that Jacque Cronje had lost control of the ball, and it was out, allowing Kelleher to swoop in and grab it. Obviously not many will understand the French commentators, but we think they're great compared to certain stations commentators who sound like sipping tea and eating crumpets is the priority. A great try the All Black who apparently still has ambitions of making the 2011 World Cup in New Zealand. It's still a long way to go, but if he stays fit and keeps performing for the top club in France, anything is possible. The All blacks came back from trailing at halftime to claim their ninth Tri Nations title and their fourth in a row when they beat the Wallabies 28-24 in a thrilling deciding match in Brisbane on Saturday. Three converted tries in the second half devastated a tired looking Australian side that battled bravely throughout and had a real chance of snatching it at the death. Flyhalf Dan Carter scored the winning try with 12 minutes left to seal the victory, although Australia kept the 52,000 Suncorp fans on the edge of their seats when centre Ryan Cross crashed over with two minutes to go to get to within four points. It was too little too late though as New Zealand grabbed both the Tri Nations title and the Bledisloe Cup, much to the delight of the large New Zealand contingent in the crowd. Coach Graham Henry said his side had shown enormous character to beat an inspired Australian outfit. "I've just got a huge amount of respect for what the guys did out there tonight. They were down 17-7 and showed a lot of togetherness and guts to come back from that," he said. It was New Zealand's third consecutive Tri Nations Test win after Auckland and Cape Town, all three achieved with the same starting 15. The success highlights the incredible depth of New Zealand rugby, with half of last year's World cup squad including Carl Hayman, Chris Jack, Aaron Mauger, Luke McAlister, Doug Howlett and Byron Kelleher, all having left to play overseas. Tempers flared as Stade Francais consolidated their lead in the French Top 14 championship with a 19-13 victory at Toulon on Friday, with both teams playing the second half a man down. Moments before half time a mass brawl broke out that had props Rodrigo Roncero of Stade Francais and David Banquet Toulon's getting red cards from ref Jean-Pierre Matheu. Toulon were already a man down as Jerry Collins had been sin-binned in the 31st minute for stamping, which must have had something to do with the new look of the Stade Francais jersey. Although the fight started in the front row, and they received the immediate punishment, it was Toulon's seasoned campaigner Norman Jordaan who landed a couple haymakers, knocking down two big guys in two seconds, something not often seen from a little number nine. It was an ugly scene of mass chaos though, as both teams gave it a full go with little pods of brawls branching off, making it virtually impossible for the officials to regain immediate control. The tension on the field boiling over was possibly a reflection of the feeling in the stands, as you could feel that something had to give. A few citings will no doubt be revealed in the next few days, which is unfortunate, because besides this crazy incident it was actually a really enjoyable match to watch. "It was a complicated victory. Toulon made quite a few problems for us in the lineouts and our play in the loose was not precise. Without our good scrum and kicking performance, we would have been in even further difficulty" said Stade coach Christophe Dominici. With the win, Stade Francais retain their hundred percent record after four matches, while Toulon left with a losing bonus point, and have yet to add to their solitary victory thus far in the season. 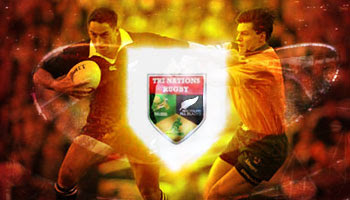 With tomorrow's 2008 Tri Nations decider in Brisbane in mind, we look back to the inaugural tournament in 1996 when the Wallabies hosted the All Blacks at Suncorp, in what was to be a classic match that was remembered for more than just the winning try at the death. Right from the get go it was frantic, with Michael Brial making himself a household name as he unleashed a tirade of seemingly unprovoked punches on All Black center Frank Bunce. We'll feature that clip in the upcoming weeks. Tries by Gregan and Burke gave the home team a formidable lead, but at 25-15 the New Zealand come back was just getting started as Justin Marshall went over for a well taken try following Jonah Lomu's storming run. With the scores tied at full time, Frank Bunce, the man who was the victim of that assault in the first few minutes, scored to break the 25-all deadlock and effectively win the first ever Tri Nations series for New Zealand. The Wallabies' only other Brisbane defeat since 1996 came two years ago when All Blacks skipper Richie McCaw inspired New Zealand to a 13-9 Tri Nations triumph in a rugged, high-quality encounter. It promises to be another tight one this weekend, but if scores are tied at full time, a draw won't be good enough for Australia as New Zealand hold a one-point advantage on 14 points at the top of the table, plus a far better for-and-against differential. The players are ready. The fans are ready, and Wallaby coach Robbie 'Dingo' Deans is ready. "We've seen some great encounters in Tri-Nations and you're going to see an even better one on the weekend." 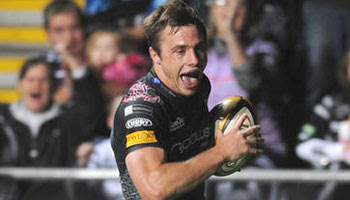 Tommy Bowe got his new Ospreys career off to an excellent start against Cardiff in the Magners League on Tuesday night, scoring a try and contributing towards a dominant all round second half performance which saw them shooting to the top of the table, picking up a four try bonus point in the process. Irish winger Bowe, a summer signing from Ulster, put on a great display, of which the try was not the only highlight. He regularly beat first time tacklers and looked very handy indeed. Fullback Lee Byrne himself had a storming match, as did Shane Williams who scored within three minutes, but it was this try by Bowe that we've chosen to show you as it featured a superb bit of control, and of course, a good bounce. Welsh flyhalf James Hook's clever cross-kick exploited the space, and Bowe improvised well to hack at it with the boot, resulting in a half-volley that popped the ball over Cardiff fullback Ben Blair. The generous bounce allowed him to collect and cross unopposed for his first Ospreys try. Bowe realises it'll be tough going competing for places in such a strong squad, but relishes the challenge. "The strength in depth in the Ospreys squad is phenomenal," said Bowe. "I couldn't believe it when I joined, there were quality international players wherever I looked. "And on the right wing it's no different as I'll have develop into a top, top player to keep out Shane (Williams) and Nikki Walker." If his start is anything to go by, he shouldn't have too much to worry about. As New Zealand ran riot against Samoa last week, notching up a century in front of a proud home crowd, this fan obviously let the festive atmosphere get the better of him. 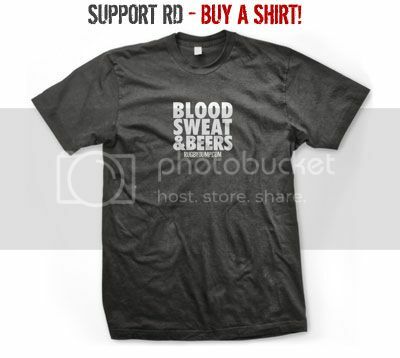 As the tries flowed, so did the beer, and as most of us know, drinking at sporting events can often go horribly wrong. The crowd, the girls, the mates, they're all ingredients for one thing - too much alcohol consumption. What goes down must come up, or something like that, and the timing by this guy couldn't have been better. As Ma'a Nonu ran at the gap, we see Pukey McNasty (as we've affectionately labelled him) leaning over the advertising boards to do his thing. Now, this was most probably coincidence, either that or the most elaborately planned advertising campaign of all time, but take a look at what the advertising board actually says, and the message it displays. When receiving an email about this clip this morning, my natural response was why on earth would I want a clip of a guy spewing on Rugbydump. I'm still asking myself the same question, but I know that the person who requested it found it funny, as did the two mates watching with him, as do I. So here it is. Weak stomach, prude, or purist - you may not like it. For us though, it's hilarious, and by sharing the video, this young fan now has his 15 seconds of fame, albeit for the wrong reasons. All credit goes to the guys at Sky NZ who spotted it. On a related note, if you haven't watched the highlights of the New Zealand vs Samoa romp, you can do so here now. Disclaimer: We don't advocate under age drinking in public by any means. But if you're going to anyway, make sure you do it in style like this guy. One of the biggest matches of the Guinness Premiership weekend took place at Kingsholm on Sunday as Gloucester played host to Leicester in an entertaining game that was the first big run out for a lot of the players under the new laws. There were two notable hits worth showing here, both coming from big Samoan wing Alesana Tuilagi, a crowd favourite whenever he has ball in hand. On this occasion he built up a head of steam in a short space of time and bashed the unfortunate Ryan Lamb out the way before offloading in the tackle brilliantly, almost setting up a try in the process. Later on, while Tuilagi was receiving treatment on the sideline, Gloucester took a quick throw in, shifting play across to his wing. He managed to hobble back into position and put a cracking hit in on the dangerous James Simpson-Daniel as he offloaded, which was shortly followed by a nice defensive tackle from Tom Croft on Mike Tindall. This clip also serves to show the excellent use of the new lineout law under the ELV's as Gloucester took that quick throw in. As the commentator notes, it only took two excellent long passes and suddenly they had yards of space to attack from. 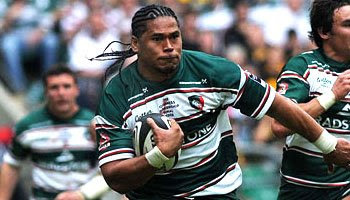 It's not the first time we've seen Tuilagi involved in the big hitting stuff, so have a browse through our Related Posts if you enjoy seeing more of the same. The Sharks shot to the top of the Currie Cup table this weekend after their remarkable come from behind 34-25 victory over the visiting Blue Bulls in Durban. All the Springboks were back in action after the Tri Nations, and both sides went at it full tilt, resulting in an eight try spectacle that was only really decided in the last five minutes. With the Sharks feeling the pressure of the Bulls, and an imminent drop goal for the win posing a constant threat, this superb try by young Sharks loose forward Keegan Daniel came out of nowhere, taking the game away from the visitors and sealing victory for Sharks. Daniel is a young tearaway who has always been physically smaller than every other forward in the country. But what he lacks in size, he makes up for in speed, skill, and heart. Previously an under 21 star, there was talk of him taking time out to bulk up before making his senior debut. But Daniel had too much to offer, and is now a fully fledged member of the Sharks Super 14 and Currie Cup squads. In this match he wore number eight, but is normally a flanker, who can often be seen flying at opposition flyhalfs and diving in for spectacular tries. Earlier this year in the Super 14 he scored against the Blues just 16 seconds after kickoff, a try which was featured in our Round 4 Pick of the Week. So while it may look strange to see such a fresh faced, tiny number eight, the quality of this try speaks for itself, and you'll be sure to see more of Keegan Daniel in the future. Six, Seven, Eight, he can play anywhere. Stick a number 14 on his back and he'll do just as well. One to watch no doubt. European champions Munster got their Magners League campaign off to a good start on Friday night with a 20-15 win over Edinburgh at Murrayfield. A solid kicking display by former Gloucester player Chris Paterson meant the final five minutes were nervy for the visitors, but through some solid defence and loads of experience, they held on for the win. 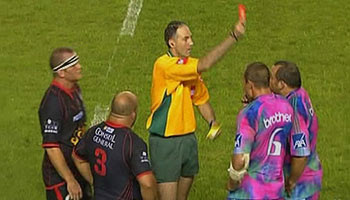 Substitute scrum half Peter Stringer unfortunately caught a stray boot with less than a minute in the match remaining. Last season we saw a fairly similar incident, with Stringer that time catching his own teamate, Federico Pucciariello, in the face. This time it was Edinburgh and Scotland scrum half Mike Blair who simply stepped over the ruck, probably trying to get his foot on the ball, but caught Stringer in the face. It looked pretty bad, as a boot full of studs to the face isn't pretty, but I'd say it was simply clumsy and a bit of a freakish accident. While a large amount of attention was on the controversial Springbok coach Pieter De Villiers throughout the Tri Nations, there is one man who possibly could have been sitting in the hot seat if it weren't for a few, dare I say it, politically motivated decisions. Heyneke Meyer narrowly missed out on taking over from Jake White despite being the frontrunner for the job. His success rate when coaching the Bulls speaks for itself, winning four Currie Cups and the first ever Super 14 title for a South African side in 2007. 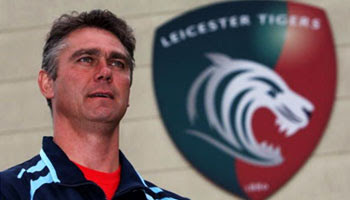 But now, South Africa's loss is Leicester's gain, as Meyer, who initially hinted at leaving rugby altogether, has taken up the head coaching role with the Guinness Premiership finalists of last season, replacing Argentinian Marcelo Loffreda. With Meyer at the helm, the Tigers couldn't have had a better start to the season as this past weekend they defeated Gloucester by twenty points to eight at Kingsholm. "We always knew it would be tough. We knew Gloucester would come out firing and that we would have to get stuck in and show some attitude. "Our fitness levels showed and I was very happy with the defence. Gloucester had a lot of opportunities out wide but we defended well." The win puts Meyer and the club in good stead for the rest of the season, and is the perfect start for the man from Pretoria who has so much to offer. This interview gives great insight into Meyer himself, and we hear from some of the players about the feeling in the camp and what the season holds. The Guinness Premiership kicked off yesterday in England, in much the same manner as the French Top 14 did - with an upset. Champions Wasps were downed by London Irish, and in the other match of the day, Harlequins beat Saracens. 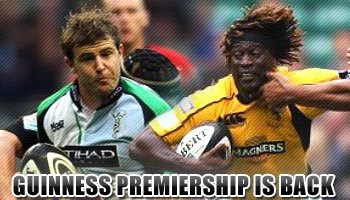 As with the French league, the Guinness Premiership will once again showcase some of the top players in world rugby. The local talent aside, there have been some big names joining clubs around England, adding interest and surely adding to the quality that we saw on display last season. Worcester will be the new home of Wallaby and former Queensland Reds star Chris Latham. The second highest all time try scorer for Australia will be approaching this next phase of his career looking to show that he's still in his prime with plenty to offer. Kiwi flyhalf Nick Evans is another star who will be hoping to increase his reputation while at Harlequins. The foreigners are not the only feature of the Premiership though, as the local talent is in abundance, with experience and youth mixing to create what should be another really enjoyable season for the neutral. The Experimental Law Variations will be at play this year, and it will be interesting to watch as the teams adjust their play to adapt to and utilise the new laws to their advantage. The Magners League also gets under way this weekend, so with contributions from dedicated users around the world, we'll once again be doing what we can to bring you the best bits from all the action taking place in Northern Hemisphere rugby this season. So, with a summer holiday in-between, we're sure this is what a lot of you have been waiting for here on RD. The good news is, the wait is now officially over. Note: If you'd like to get involved in contributing, please drop us an email. 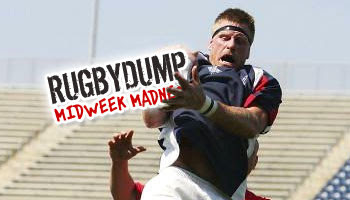 We've got something slightly different for you today on Rugbydump. 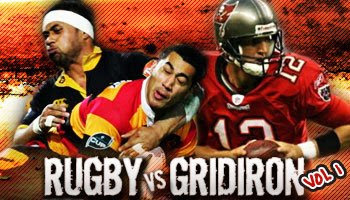 As lovers of all sports, we've teamed up with the talented J-Fro to bring you this awesome video, simply entitled, Rugby vs Gridiron. While the name might be misleading for some, this is by no means a comparison between the codes. It is simply a brilliant showcase of why it's possible for some to be fans of more than one sport with odd shaped balls, as many people are. The aim is to show the best parts of Rugby Union, Rugby League, and American Football. Being a fan of all three, J-Fro's objective was not to show one sport as being superior to any other, but simply show the appreciation and enjoyment that can be found in all of them. Volume 1 mainly highlights the running game in the three codes, with some big hits thrown in for good measure. To some, NFL on Rugbydump may be blasphemy, but we see it differently as to us, the result of this creation is one of the most well put together videos out there, with a full array of big hits and incredible skill from the three sports that after all, have a fair bit in common. We're interested to hear your thoughts, as while we're not huge NFL fans ourselves, we can certainly recognise a brilliant sports video when we see it. Hopefully it will be appreciated for it's entertainment value, because after all, that's what it was made it for. Enjoy, and if you're a cross code fan yourself and loved the vid, by all means let us know. Possibly the game of the weekend in the Air New Zealand cup was the tussle in Palmerston North between Manawatu and North Harbour. 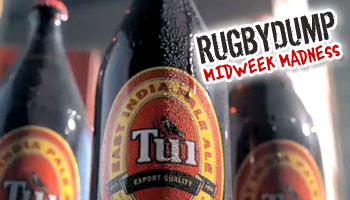 It went down to the wire, with some poor option taking and over eagerness at the end costing Manawatu the match 20-17. We got to see two great textbook hits, one from each side. The first in this clip is on big All Black Sevens star, Lote Raikanbula as he cuts through the line. It looks like halfback Chris Smylie who actually puts in the hit, lifting him and driving him back to the ground, halting his progress instantly. The second came from Manawatu replacement prop, the big Tongan Talau Hala. His was more of a hard hit, as he knocked back North Harbour eighthman Viliami Ma’afu. Ma'afu scored two tries on the night, so getting smashed by the opposition wasn't too much of an issue for the 105kg loosie. The hit itself was great to see though, and shows what good timing and technique can do. 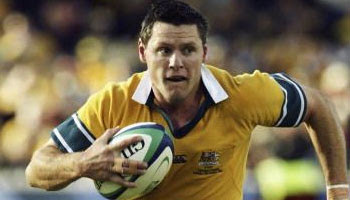 A week ago, upon the announcement of his retirement, we featured a classic try by legendary Wallaby fullback Matt Burke. This week we thought it would be nice to follow up with this interesting snippet off the show Total Rugby. We get to see Burke and his Newcastle teamates at his testimonial cricket match, against the Western Force believe it or not. As on the rugby field, Burke oozes class in everything he does, and delivers a lovely square cut for four, but is then unfortunately caught out when going for the big one. The clip gives great insight into how he came up through the ranks, starting with Rugby Sevens alongside greats such as Campese and Lynagh. His rise to the Waratahs and the Wallabies followed shortly, and we get to hear from the man himself as he talks us through those special moments in his career. Playing in Newcastle for the past few years, Burke touches on his struggles with understanding the Geordie accent, and reflects on his time in the game he loves, and how being paid for it was simply a bonus. Oh, and he did take a wicket in the cricket too, as his gentle doddle of an offspinner bamboozled the Force batsman into thinking he could knock him out the park. Wellington produced a slick 48-12 win over Bay of Plenty in the Air Zealand Cup on Saturday afternoon. With the two sides unbeaten until round four, the match was surprisingly one sided and produced some great moments of running rugby. Hosea Gear picked up a hatrick on the way to placing his side at the top of the table, but probably the most enjoyable try to watch was this one, finished by Newcastle Falcons new signing Tane Tu'ipulotu. Started by the dynamic Corey Jane deep in their half, the neat chip and regather was shifted through the hands with all the skill and class of a team at the top of their game. The running lines and timing of the offloads were great to see, and the unselfish manner in which Gear offloaded to Tu'ipulotu is probably indicative of the feeling in the side at the moment. An interesting thing to note is that the counter attack came after Bay of Plenty took a rushed quick lineout (under the new rules), which can at times amount to a lot of disorganisation on defence, particularly if you end up kicking the ball away. PLEASE NOTE: This video has unfortunately been removed by Mediazone, who own the rights to the footage and no longer allow us to use it. Apologies from our side.